T-Shirts are classic icon of casual wear and it is loved by everyone, including boys, girls, men and women. Available in a wide variety for men and women, T-shirts can also be combined blazers for formal occasions. You can find a wide range of t-shirts on DealsCorner from well-known brands and online stores. DealsCorner is one of the leading comparison sites where you can find products from major online stores like Jabong, Shopclues, Pepperfry, Flipkart, Infibeam, Amazon and many more. You can easily compare the products and prices offered by the various online stores and then choose the product of your choice in the lowest price range. Whether you want to buy t-shirt for yourself or to gift anyone, choosing the right fit and fabric is important while choosing the t-shirts. It is also necessary to understand whether you are choosing for men, women or kids. The sizes, designs, colours and styles are different for each of them. Most of the people choose cotton t-shirts for men and women because it is durable and comfortable to wear in all seasons. Avoid cheap alternatives t-shirts with fast colour which can fade out within short time. Ensure the weaving of the t-shirt is proper and it is made up of superior quality of clothing, so that it does not bobble after few washes. Also consider the type of activities you wish to do wearing the t-shirts, for example if you want to use it for gym, exercising or playing sports then choose water resistant synthetic or polyester t-shirts which are durable and last long. If you want to wear t-shirts for casual occasions in the sunny days then look for cotton t-shirts. Cotton fabrics are soft and comfortable to wear and it also easy to maintain. While choosing the t-shirts, you can also check the GSM (grams per square metre) which indicates the density of the fabric used to make the t-shirt. However the GSM is not the measurement to check the overall quality of the t-shirt, but you can measure the quality of fabric used. Consider the type of cut while choosing the t-shirts, like v-cut, round neck, with collar like polo t-shirts, or without collar. You can also find a wide range of printed and creative t-shirts majorly in women and kids garments. There is a plethora of options in the t-shirts in different sizes, including extra sizing for men and women. You can find t-shirts from any local store, but most of the local stores have local brands or limited stocks. Instead of choosing the cheap local brand alternatives, take tour of t-shirts gallery on DealsCorner. 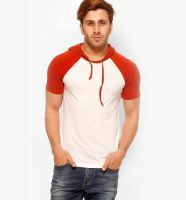 You can find a wide range of t-shirts from almost all major brands and online store on DealsCorner. We have many well-known brands like Campus Sutra, Yepme, FreeCulture Express, United Colors of Benetton, Puma, Phosphorus, Incult, Incynk, Nike, Jack & Jones and many more. Shopping on DealsCorner is simple and easy. Just search the product you need, use the filtering options given on the product search page, compare the prices offered by the online stores and choose the product of your choice in the lowest price range available in India.